Apples, broccoli, cherries, almonds-they all have something in common that may surprise you. Besides the fact that they may be in your kitchen right now, each one of these foods is available thanks to the honey bee and other pollinators. In fact, about one-third of the human food supply depends on bees and other pollinators. Chances are, honey bees have a hand in producing some of your favorite foods. And with all of their hard work, bees need to eat, too. However, bees are struggling to find adequate, diverse food sources due to habitat loss. Recently, the White House launched the Million Pollinator Garden Challenge to create ways for everyone to support the issue and increase forage. With a global population expected to rise to more than 9 billion people by 2050, 70 percent more food will need to be produced. This means we all have to pitch in to help feed the bees so they can continue to produce the fruits, nuts and vegetables that people need for a healthy diet. Join the effort to create a million pollinator gardens and feed the bees. • Learn more about native bee-attractant plants. The Pollinator Partnership’s Bee Smart mobile app can help you choose the best plants to grow in your garden to attract bees and other pollinators. 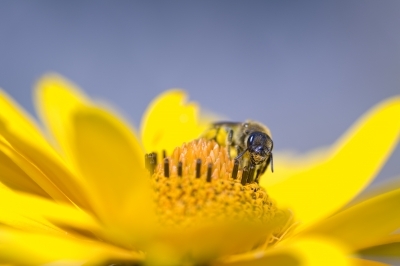 Feed a Bee is an initiative to increase forage areas for honey bees and other pollinators. By visiting www.FeedABee.com, you can ask the Feed a Bee initiative to plant flowers for you that produce the pollen and nectar that bees need to survive and thrive. Nearly 200,000 people have pledged to plant 50 million flowers in the U.S., and it doesn’t stop there. Feed a Bee is also partnering with government and nonprofit organizations and businesses across the country to plant thousands of acres of forage for bees. • Grow your own bee-attractant plants. Through FeedABee.com, you can also commit to planting your own bee-attractant plants using a helpful growing guide and tips for creating bee-attractant habitats for pollinators. Additionally, you can share your planting photos using #FeedABee on Twitter, Facebook, Instagram and Tumblr. Whether you own acres of land or a flowerpot on your balcony, have a green thumb or struggle to keep fake flowers “alive,” you can play a part in helping to feed a bee and, in turn, help them feed the world. To learn more about bees and why they are important, visit http://beehealth.bayer.us/home. Here’s the buzz when it comes to backyard fun: Before you plan those barbecues, pool parties and bonfires, you need to transform your outdoors into a great entertaining environment and stop insects from making themselves at home. 1. Good gardening: Choose a lively combination of colorful plants and flowers to brighten your outdoor spaces during the day and light them at night to add drama. Try citronella plants and marigolds to naturally repel mosquito populations and be sure to eliminate standing water as it attracts mosquitoes. 2. Check your equipment: Make sure the lawn mower, weed-whacker and the like are primed and ready, blades sharpened, tank refilled and so on. 3. Rake it in. Get rid of last year’s dead leaves and twigs that can keep your lawn from soaking up the sun. Consider composting the debris. 4. Beating the pests: Fortunately, protecting your yard against insect-borne diseases such as chikungunya, West Nile virus and Eastern equine encephalitis (EEE) does not have to be a challenge, nor does it have to involve chemical sprays. Instead, you can use environmentally friendly solutions to keep bugs at bay while enjoying the outdoors. 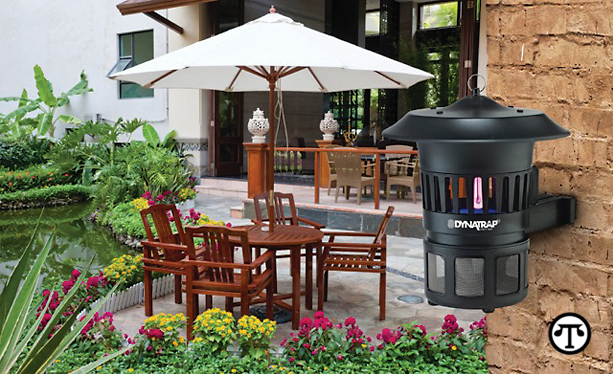 For example, Dynatrap insect traps can provide relief from mosquitoes, biting flies and other flying bugs without pesticides. Since they come in a variety of styles and finishes, you can even find one to match your deck decor. 5. Grilling idea: Clean the grill after each use to save yourself time and trouble when you want to fire it up for your next get-together. That will also help keep bugs from hovering on the deck. 6. Deck design: Your outdoor space can make or break your backyard, so be sure it reflects your style and makes a statement. Keep in mind the primary use of your outdoor space and remember to think about mosquito control as it relates to the size of your yard. Position the insect trap where it will draw bugs away from where you spend most of your time. For further facts, visit www.dynatrap.com, Frontgate and other retailers, or on Facebook, [email protected] or Pinterest. While the idea of composting may make some homeowners squirm, the process isn’t nearly as complicated – or stinky – as some may think. A walk through the woods is a good example of composting at work. Does the forest smell like a garbage bin or did it smell earthy and almost sweet in the warm sun? All those leaves, weeds and organic material are constantly breaking down, adding rich layers to the forest floor. 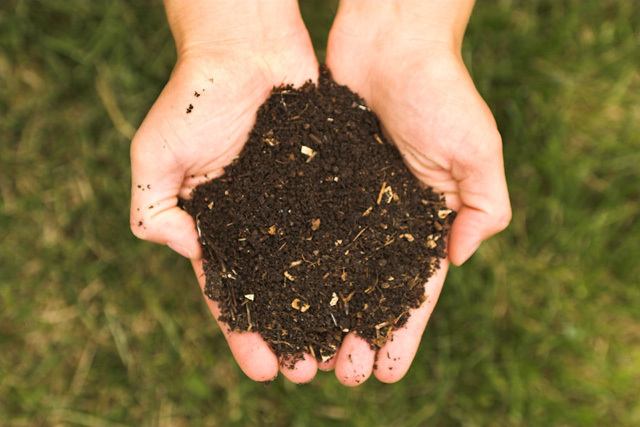 Compost, once broken down, has a pleasantly organic smell to it, and even during the process it doesn’t give off an incredible amount of odor if one is adding the right ingredients. For those who are restricted to small spaces such as postage stamp-sized backyards or apartments with balconies, there are enclosed compost bin options. Though the composting process moves more quickly with open bins, the enclosed containers are still a practical and viable option. Whether one decides on an enclosed bin for a small space, a standard composting bin from the local hardware store or http://epa.gov/epawaste/conserve/rrr/composting/by_compost.htm”>home composting. Once the composting pile is started, it needs to be turned every once in a while to make sure all those composting microorganisms are getting enough oxygen. Not enough air and the compost will become dense, slimy, stinky and potentially unusable. For this reason, don’t pack down materials when they’re added to the pile. Leave room for some air flow. For those homeowners using a rotating composting bin, turning it is as easy as giving the bin a couple good spins every few days or so. If the bin is a simple box design or just can’t be turned, use a pitchfork or shovel to turn as much material as possible every few days. This is another reason why it’s good to keep home bins small. Anything larger than a 3′ x 3′ x 3′ bin might be a touch unwieldy. And though that space may seem small, keep in mind that material, as it composts, degrades by about 70 percent. Additionally, be sure to keep the compost pile moist. Not soaking wet as that might kill those microscopic composters, but not bone dry as those little beneficial bugs might dry out. Adding green materials, such as grass clippings, will help add to the moisture content, but just checking it every once in a while and soaking it with a hose if too dry should keep the moisture content steady. Starting to get a bit stinky? Add some more carbon to the mix. Too much nitrogen results in that strong ammonia smell that turns off a lot of potential composters. But by adding more brown materials to the bin, the nitrogen amounts will even back out. An average home composting bin will take from six months to a year to compost entirely. For those using an enclosed composting bin, it might take up to two years because of the tight environment. If there’s enough space in the backyard, keeping two compost bins will keep available composting in regular rotation by filling up one over six months, then filling up the other. Once the second one has been added to for six months, the first one should be ready to go. Brent Hardy is Vice President of www.extraspace.com responsible for all corporate construction & facilities management. He writes about corporate sustainable practices at blog.extraspace.com/category/sustainability</. Are you thinking about adding a rainbow of color in your garden? Rainbows certainly inspire a feeling of joy and hope, don’t they? A rainbow-colored design of flowers and other plants could be a gorgeous way to showcase lovely flowers on your property. Some people design a bow on their front lawn or around the center of their yard to section off different areas. A lovely mixture of colors like red, yellow, orange, violet, and green in a bow shaped design could make your garden the envy of the neighborhood. · Plan carefully. Flowers you might envision looking lovely in your rainbow garden beds may or may not work well together and may or may not grow well in your space. You’ll want to pick the right flowers for your area with consideration for the amount of sunlight the area gets. If you’re new to gardening, your first year might be a bit of a gamble but getting some skilled advice can increase the chances of everything turning out the way you hope it will. You can talk to a landscape gardening company or the expert at your local garden centre to get some expertise. 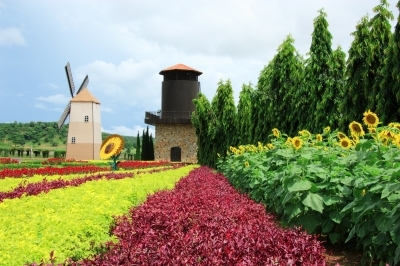 · It’s wise to plant a rainbow garden with plants, rather than with seeds. This will make it easier to arrange everything to look the way you envision and will help you achieve the look you are going for as you won’t be as likely to have a sparse looking flowerbed where flowers bloom at different times. · Sketch out your plan. A bit of planning can go a long way in achieving your desired goals. Writing down a game plan with a list of the things you’ll need is a good idea and the map of your flower arrangement can help keep things straight, especially if you’re getting help with the planting. If you’re planting perennials, be sure to leave a bit of room for expanded growth. · Consider installing some sort of edging to help shape the border initially and to help you keep grass and weeds from creeping in to your flower garden. · Don’t forget to set up a nice sitting area nearby so that you can sit, relax and admire your handiwork! Jen Byiers writes for Gardens Galore, a company with green fingers and a passion for garden landscaping. If you want to freshen up your living space and create a more “green” home environment, consider adding some stylish indoor plants and flowers to the area. Certain plants and flowers are perfect for windowsills, tabletops, and even work well as centerpieces. These plants and flowers can add a burst of color to an otherwise drab area, and also make the air cleaner! 1. Potted Mixed Greens. An indoor basket filled with mixed greens and bold-colored flowers is perfect for any small room or space that doesn’t have much décor. Pick up something that has an assortment of ferns, large-leaf plants and a few flowers. 2. Tropical Hibiscus potted plants. When you want to create a tropical-inspired setting, pick up a potted hibiscus for its beautiful flowering blooms. Tropical hibiscus flowers are usually a bright pink, yellow, and white in color and will instantly liven up the living space. 3. Peace Lily. A great indoor plant that works very well as a centerpiece is the Peace Lily. The white lilies aren’t overbearing and each plant has plenty of green leaves to create your “green” look you want. These are a good match for relaxation rooms and even bedrooms – anywhere where you want to create a soothing, relaxing environment. 4. Jasmine. The beautiful white flowers of the Jasmine plant are also a great match for centerpieces and will freshen up any dull room in a flash. These plants are also very easy to maintain and can be a good fit for living rooms, office spaces, and dining rooms. This is also a very lightly-scented plant so you can enjoy the jasmine fragrance wafting through your living space. 5. Brazilian Fireworks. This bold and bright bouquet of flowers and leaves will quickly become the main attraction in the living space. This is another indoor houseplant that is easy to take care of and may be a good fit for your dining room table, a mantel, or an empty side table. It’s definitely a standalone houseplant that commands attention! 6. Guppy Plant. The thick leaves and bright orange blooms of the Guppy plant make this an attractive addition to any living space. This plant is full of life and character. Since the stems tend to arch, it’s also a good fit for hanging baskets. 7. Shrimp Plant. This is actually more of a shrub and can be lined up with other indoor house plants and flowers. 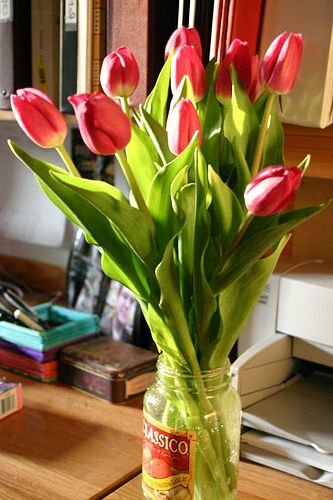 The plant does tend to produce several flowers throughout the year so it will always add some color to your living area. Consider purchasing a set of these plants to line up along a shelf or mantel. 8. Guzmania. If you’re looking for a showstopper, this is it. This exotic-looking plant has a deep red, orange, and yellow flower in the middle and produces very long, tendril-like leaves. It’s perfect for side tables and also as a centerpiece. 9. Scented Geranium. When you need a fragrant houseplant to keep the air clean and add a nice scent to the area, pick up a few scented geraniums and pot them in separate pots to leave around the home. You can actually choose from a range of scents including lime, ginger, and chocolate. 10. Tea Rose Begonias. Begonias are among the more traditional types of houseplants out there but the Tea Rose variety can add a pop of color to the living space and also produce a fresh scent. The flowers in this plant tend to cascade over the pot so make sure to place them up on a higher shelf or bookcase. Aileen Pablo is part of the team behind Open Colleges, one of Australia’s leading providers of TAFE courses equivalent and interior design courses. 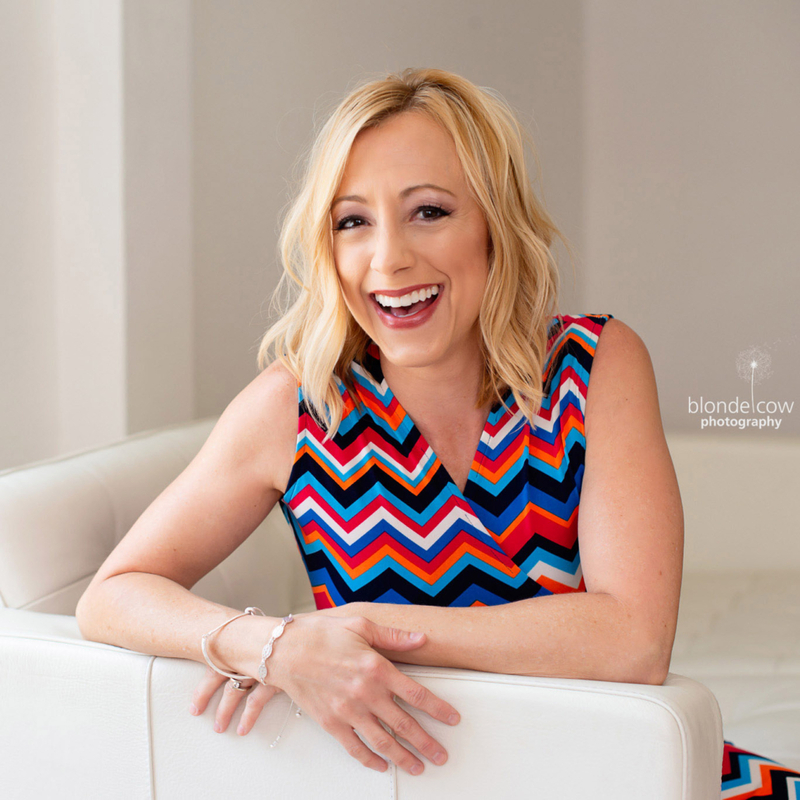 When not working, Aileen blogs about travel, lifestyle, home improvement, and beauty tips. She is also often invited as a speaker in Personality Development Seminars in the Philippines. Children are like miraculous sponges. They love to learn and the quicker that you teach them things, the longer it will stay with them; sometimes, well into their adult years. So, when it comes to teaching your kids how to eat and grow organic foods, this essentially means that you’re instructing them on how to be proactive about their health as well as being sensitive about the needs of the environment. That’s definitely a set of tools that they can add to their lives that will pay off for years to come. There are many reasons why organic is best. Organically grown food is free of a lot of the pesticides, preservatives and other chemicals that are used with conventionally-grown foods. It’s not genetically modified. When it comes to organic meats, there aren’t synthetic drugs and other hormones that are oftentimes found in the traditional store bought brands. Because the soil is well-replenished, organic produce has been proven to be packed with more nutrients. And, if you ask a lot of people why it’s ultimately their first pick, it’s because all of these things combined result in organic foods tasting better. If you start them on this diet from the very beginning, this really won’t be a hard sell. Therefore, the sooner you get them accustomed to an organic eating lifestyle, the easier for them it will be. But, if you have recently discovered for yourself the many benefits that come with going organic and your children are older, there are a couple of creative approaches that you can take to get them adjusted to the transition. Why not hold a taste test contest? Serve up some raw fruits and vegetables: one bowl filled with conventional foods and the other with the organic kind. Blindfold them and then ask them which one tastes the best. Another option is to have a cooking contest where everyone in the family has to cook one dish from an organic recipe. Have everyone write down their grocery list and take your kids shopping with you while you pick up the foods for the various meals. This will get them acclimated to not just seeing organic foods, but understanding how to make the best selections. Give a prize for the best dish and in no time, you’ll have your kids suggesting to you some organic meals that they’d like to try (or try again). There’s a wonderful way to get in some quality family time while instructing your children on how to grow organic foods and that is to grow a garden. 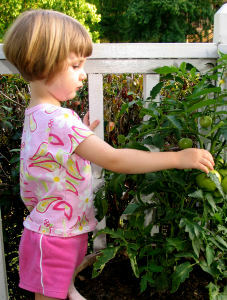 You can start out by having everyone pick a fruit or vegetable that they would like to grow. Then, you can either build one from scratch in your backyard or you even grow some in containers from the comfort of the inside of your home. TLC’s HowStuffWorks.com section has an article on how to grow up to 66 different foods in your house; everything ranging from apples and cherries to tomatoes, peppers and summer squash. If you would like to take on the great outdoors and you’re new to the food gardening experience, YouTube.com has a lot of videos that can walk you through all of the steps that you need. Just put “Grow a Garden” in the search field. As you’re getting your children used to the organic way of life, remember that education is best for children when it’s fun. So, as you’re teaching about organic food, make sure, most of all, to make it a light and tasty (pun intended) experience. That will make them want to repeat it and that’s the most effective way that anyone can learn. What could be more evocative of summer than to see your garden filled with brightly-colored butterflies fluttering from flower to flower – beautiful to watch, but perhaps even more beautiful to see close up. Their fascinating life-cycle will prove irresistible to kids, too! But with their habitats under threat and numbers falling, what is the best way to attract them to feed and breed in your garden? As is so often the case, creating the right habitat is key. 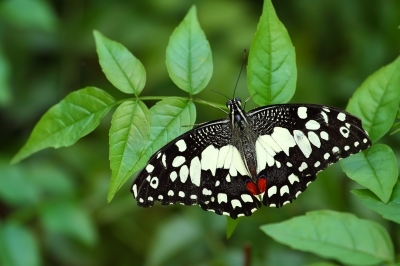 While doing any of the steps set out here will help, if you are really serious about creating a healthy population of your favorite butterflies, it’s best to think about the whole life-cycle, from egg through to the mature butterfly. Butterflies have evolved over millions of years to fit into the wild landscape, so it’s that wild landscape that we need to try and mimic – because many of the things we do and the plants we grow in our modern gardens might look pretty to us, but really are not enjoyed by the butterflies! When looking for a place to lay their eggs, butterflies will look for plants that will give their caterpillars the food and shelter they need. There are several well-known favorites: holly, ivy, stinging nettles, buckthorn and thistles for example. Leave a patch of your garden a bit wild. Vegetable growers will not look forward to their cabbages and kale being devoured by caterpillars though – and it can be a problem. The last thing you should do of course is spray with insecticide. Instead, try moving any caterpillars you find onto less valuable plants by hand, while planting nasturtiums in amongst your crops can help as well, as these are well liked by the insects. Butterflies feed on nectar of course, so you need to choose nectar-rich plants that have flowers throughout the season, not just at the height of summer. Some early flowerers include: bluebells, dandelion, honesty, primrose, sweet william, wallflowers and violas. Buddleia, hebe, lilac, lavender, valerian, forget-me-not and honeysuckle, thyme and ivy will flower later on in the summer and autumn. If you have space for a patch of native wild flower meadow, they would love it – pretty too! Plant your flowers in the sunniest spot you can find, and wait. They will find you! Stephen Bailey is an experienced gardener and garden designer who writes and blogs extensively on the subject. His website Tern Gardening Reviews has all sorts of information on gardening tips, tools, equipment. Greening up your living space can mean many different things. It could start simply enough with recycling bins and conservation efforts (cutting down on the usage of water and electricity in your home). You might even opt for non-VOC paints, reclaimed wood flooring and cabinets, the addition of mirrors to maximize natural light, and furniture and accessories made by eco-friendly manufacturers. If you’re really keen to create the optimum green home, you could even pay to install solar panels and put in a system to filter gray water for your landscape. The point is that there are tons of ways to go green when it comes to your home. But you may have overlooked one of the most obvious; the addition of plants and flowers to your space. There are plenty of reasons to include these living, breathing decorations in your interior design, not the least of which is that potted plants are eminently eco-friendly. Consider, for a moment, the alternative: artificial plants. While they are certainly easier to care for (no watering or trimming required), they are a synthetic product, which means that they are likely tied to the waste and pollution that often results from mass manufacturing. Whether they are plastic or silk (or some other fabric), they no doubt require chemical processes that are somewhat less than acceptable to anyone on the path of environmental conservation. Live plants, on the other hand, are better for the health of the planet, and your own health and wellness, to boot. For years, study after study has shown that natural beauty provides for a calm and relaxing atmosphere, which makes plants a great addition to your personal retreat. Flowers are not just pretty ornamentation for your décor; they have also been shown to reduce stress and anxiety and boost your mood. In short, they make you happy. But they can do more than balance your mental state. They also do wonders for your physical health. According to NASA, which has done several studies on the effects of house plants in enclosed environments, adding greenery to your space not only adds oxygen and reduces carbon dioxide (which could help you to feel more energized and alert); it also helps to remove toxins from the air. 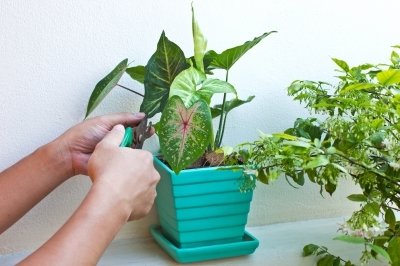 In particular, certain plants have the ability to drastically reduce VOCs (volatile organic compounds) that are released by paint and plastics, as well as toxic chemicals that are common in many households, such as cleaning solvents, exhaust fumes, and smoke from tobacco products. You may be surprised to learn that these compounds can linger for years after they are introduced to the environment, long after you can actually perceive them with your sense of smell. But NASA has proven that plants help to reduce these toxins by nearly 90%. Common indoor species of the ficus or palm variety (amongst others) offer some of the best options. And don’t forget that they look pretty nice, too. So don’t hesitate to include some everyday greenery in your home and hit up your local New York or London florist once in a while to add some flowers to the mix. You’ll create a beautiful interior space that is good for your health (both mental and physical) and the health of the planet. Don’t ever start out with a pesticide. Pesticides often do more harm than good. They deposit toxic chemicals into the soil, kill beneficial insects like earthworms along with whatever insect you are trying to control, and contribute to growing thatch layers, which in turn harbor pests. You should only use pesticides if nothing else fixes your pest problem and the damage is reaching a severe level. Look for significant pest damage weekly. Catching a pest problem early will help prevent a lot of potential damage to your lawn. Do a walkthrough of your lawn and carefully inspect active areas. Correctly identify the signs you are seeing. A brown and thin lawn – one indication of pest damage – could also be due to the improper use of herbicides or fungicides, over watering, over or under fertilizing, or urine spots from the family dog. Other signs of pest damage include more weeds than usual, a larger population of adult insects (pests in the lawn tend to be in the larvae stage), and more animals scavenging your lawn at night. Do a drench test. Just seeing insects in your lawn is not enough to determine that you have a pest problem. That insect population must be larger than the lawn can sustain. To find out the average number of insects in your lawn, mix one ounce of dishwashing liquid with one gallon of water, and pour it over one square yard of grass. Any insect will crawl to the surface. Take pictures of every different insect and count how many of each insect you see in the square yard of grass. Research university or cooperative extension sites to identify your insects, and then find out the average number of insects that should be in each square yard. If the insects you found exceed that average, you have a pest problem. Culturally manage the insect population. Find out what kind of environment the invading insect population prefers, and try to eliminate those conditions through healthy lawn maintenance. Over watering or over fertilizing will attract any insect to a lawn because there is more grass for them to feed on. Large thatch layers also provide a safe habitat for many insects. Try to limit these conditions if you can. Biologically manage the insect population. Introducing natural predators is an environmentally friendly way to manage a pest problem. Different insects will require different means of biological control, but each predator will be selective and will seldom harm beneficial insects. Chemically manage the insect population. If all else fails you may use a pesticide. 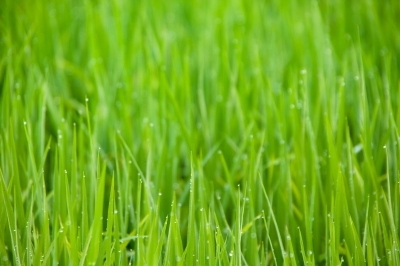 Research thoroughly which product is best for your grass seed lawn and the pest you are treating. Follow all the instructions exactly, and wear rubber gloves and long sleeves when applying the pesticide, as a protective measure. Jonathan McGraw is a natural landscape designer who writes for Naturesfinestseed.com, the go-to source for solving the most complex reclamation challenges. He suggests Kentucky Bluegrass seed for the best appearance and versatility, and Zoysia Grass seed for its drought resistance and tolerance of salty and alkaline soils.